Here in the US, many ordinary people are pleased to know that Tony Blair is back in power in the UK. But those in influential circles in Washington may be disconcerted about his reduced majority and its impact on the transatlantic alliance. President George W Bush called Mr Blair from presidential plane Air Force One, while en-route to Latvia, to congratulate him. 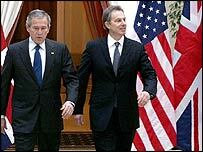 The president told Mr Blair he looked forward to continuing to work together. Of course, Mr Bush had never actually endorsed Tony Blair's campaign, because the White House refuses to get involved in election battles in other countries. But Mr Bush has made no secret of his fondness for the British prime minister, calling him "a good friend and a strong ally". Both sides in the US political scene may, however, take some comfort from the UK election result. The Republicans will rejoice to see their trusted ally Mr Blair winning a third election victory. But Democrats may calculate that his reduced majority will mean a swifter succession by Gordon Brown, who has always remained closer to the Democrats than Mr Blair. Some arch conservatives here will worry that Tony Blair's smaller majority will make him less willing to support the US in any new international forays. And there is a perception in the media here that Mr Blair's standing has been damaged at home. The New York Times called his victory "bitter-sweet" because of the unpopularity of the Iraq war among the British public. The Washington Post headline said his win was "diminished" because of the fall-out from Iraq. In an editorial, it argued that while Mr Blair is one of the most brilliant politicians in British history, he is now "unloved and not fully trusted". But US coverage of the British election has been rather thin, since there was little likelihood of a change. Tony Blair is popular in the US. Most Americans like him for his support following the 11 September 2001 attacks and his unwavering support of President Bush in the US-led "war on terror". If individuals here are unhappy about the war in Iraq, they blame Mr Bush, not Mr Blair. But few people here know much about the other leading figures on the British political scene. Most would struggle to place who Gordon Brown is, even though he may be the most likely successor to Mr Blair. A straw poll on the streets of New York on election day suggested no-one had even heard of Conservative leader Michael Howard. His decision to step down will bring only blank faces here in the US.